We are very excited to announce today that as of a couple weeks ago we added a brand new feature: Reminder Timing Profiles. What are Reminder Timing Profiles? 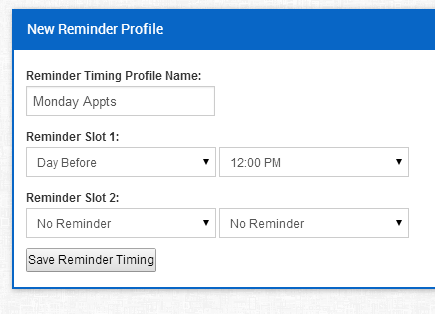 Reminder timing profiles are custom settings you can apply to each appointment you create. Lets say that you don’t want your appointment reminders to be sent out before 12pm on Sundays. Previously the only option you had was to set your reminder timing settings for ALL of your appointments to 12pm the day before scheduled appointments. But no one wants to do that! Now with custom reminder timing profiles you can create custom timing settings that you can apply to individual appointments. Each appointment that you schedule can have 2 of each kind of reminders sent out to your clients. You can now completely control when your clients will receive their appointment reminders. Once you have created and saved your appointment reminder timing profiles, you can apply it to new (or existing) appointments during creation or when editing them. We are very excited for the addition of this new feature as it unlocks another higher level of customization to our service. Whether you’re making custom reminder timing profiles for each client or each day, it’s all possible now. As always we are open to any new feature suggestions so please don’t hesitate to contact us and inform us of changes/additions you’d like to see within our service.